Thanks so much for stopping by! I believe that everyone can have a beautiful home without spending a fortune! One of my favorite things to do is find creative ways to re-purpose things I already have on hand, or have picked up at yard sales and thrift stores. Join me as I share with you some of my favorite ideas for crafting and decorating, as well as travel adventures, and fun things that I pick up on my treasure hunts! 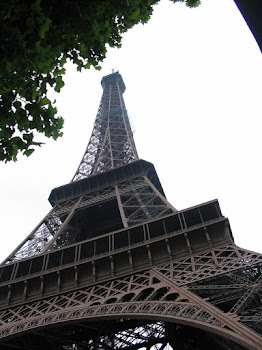 Much of my work is influenced by my love all things French, nature, and of course shabby chic! I have gotten so many creative ideas from you very talented bloggers out there, and I hope that I can be an inspiration to you as well! Viola! My decoupaged French themed cabinet! Not bad, but as soon as I bought her from a friend's garage sale, I knew I wanted to give her a makeover with a French Accent! I began by giving her several coats of creamy white latex paint. Oh, almost forgot to mention the addition of these pretty wooden appliques. I think I am addicted to them, as I seem to use them on lots of projects! You can buy them at Hobby Lobby or Michael's. Just use a bit of epoxy to adhere them. Remember, a little bit of epoxy goes a long way! You don't want any seeping out. I really love the adorable print that I used on the front of the cabinet. It is a copy of a reproduction vintage print I bought on a trip to Paris. Since I didn't want to use the original print, I wen to Staples and had a copy made onto cardstock. The print is of vintage soap advertisements, and I think it is just darling! If you have been following me for awhile, you know I am crazy about the look of vintage French text. Well, I knew I wanted to use it on this project both inside and out. So I decoupaged pages from a vintage French book around the border of the outside, since my print didn't come all the way to the edges. Then I decoupaged them on the inside as well, so you get a fun little surprise when you open the door! Here's another look at the appliques. I love how they give instant character to just about anything! And a closer look at the cute print! One more look at the inside and out. I did learn a few lessons along the way with this project! I was lazy and didn't remove the hinges on the door (even though I knew better!). Well, they got all goonked up (highly technical term!) with paint, making them difficult to open & close. So, I had to remove them and buy new hinges! Phooey! Other than that, I had so much fun with this project, I think it's one of my new favorites. I am going to put her in my Etsy shop, and if she doesn't sell, I won't exactly be heart broken!! What projects have you been working on lately? Hope you all have a wonderful day! I am joining up with the following linky parties. Be sure to check out all of the great inspirations! Love!!!! Please keep us posted on how quickly this goes bye-bye because it will be soon. I also hate when things get goonked up, and I'm so glad I'm not the only person who knows what that means! Oh wow, how do I say breathtaking??? It is exquisite!!! This is a masterpiece...truly! I love the term "goonked up" LOL, I think we've all goonked things up at times! That turned out just awesome! Love it! She's beautiful! I love using text book pages inside projects too. What a wonderful job! You did a great job..and in this particular case (I don't give in easily) the white is the best choice..and I really love the graphic..
Okay- I came here and did a nice longish post...and now..uh...did you delete me or what? lol I SAID-I love this little piece and you did a fantastic rehab on it. I use those little decorative appliques all the time too. Did you know that there is a wholesale place you can buy from that is really cheap? I used to order from them all the time when I was doing a lot of projects. This piece is wonderful!!! There is no doubt in my mind that this will be in your Etsy shop very long! Great job! Cool! You are giving me ideas here...love the little corners you added! These turned out so unique-love the individuality! What a sweet little cabinet it is now! GREAT transformation! She looks sooooo much happy now!!!! Hi Donna....I left a comment, but it didn't publish...what da? Just wanted to tell you how pretty I think your little cupboard turned out. LOVE the little corner pieces! Very sweet. WOW!!! GREAT job ~ what a treasure. The pages inside as liner just makes it perfect. This is really a darling cabinet. Anything French gets my attention. Love the print and text inside and out. You did a wonderful job! Beautiful project, Donna~ just turned out wonderfully! Just popped over to wish you a blessed day! I'm so glad you shared the finished cabinet with us! It turned out fabulous!! Thanks for your sweet comment on my blog. :) To answer you question... the top on my kitchen island is galvanized metal that was folded over the original wood top and nailed into place (by the antiques dealer). What a wonderful makeover! Now you have a beautiful unique piece! So happy I stopped by! WOW! You did a great job.....Lovely. Sigh. Donna, I just really do not have any space in that mess of a room do try this on an old, small 3-drawer chest that I have. It will end up in the pile of things not finished, and that cannot get any bigger!!!! Your cabinet is gorgeous. So gorgeous that I might have to try it any way!!!! Oooooh, It's always good to have something pretty to look forward to, right???? Love the cabinet... so pretty... turned out great! Happy WW! I wish I was so lucky to find a sweet cabinet as yours. You have done a fabulous job and I like the wood molded corners. Gorgeous gorgeous gorgeous! Love the way this came out, you clever woman. So pretty. Cute, cute, cute! I love how this turned out. Your cabinet is darling and oh so frenchy! The appliques were the perfect touch! It is so much better--love the little details and extras, thanks for sharing! Oh this is so adorable!!! Very good job! This extraordinary! Just Beautiful! The images are great. You did a really beautiful job of putting this together. so so pretty! i love french vintage ads, especially soap ones! Hi Donna, Thanks for linking up this GORGEOUS cabinet--I love it!! It's always been of my favorite creations I've ever seen!!! This is just fabulous! I love the images and all your lovely details! Beautiful, Donna! Love how you made this your own...absolutely wonderul job! Oh my Goodness! This is So Beautiful!Your Works is Wonderful! So sweet! I love the french accents and the idea of printing off the original instead of using the original is wonderful! I really enjoyed your site. Thanks. 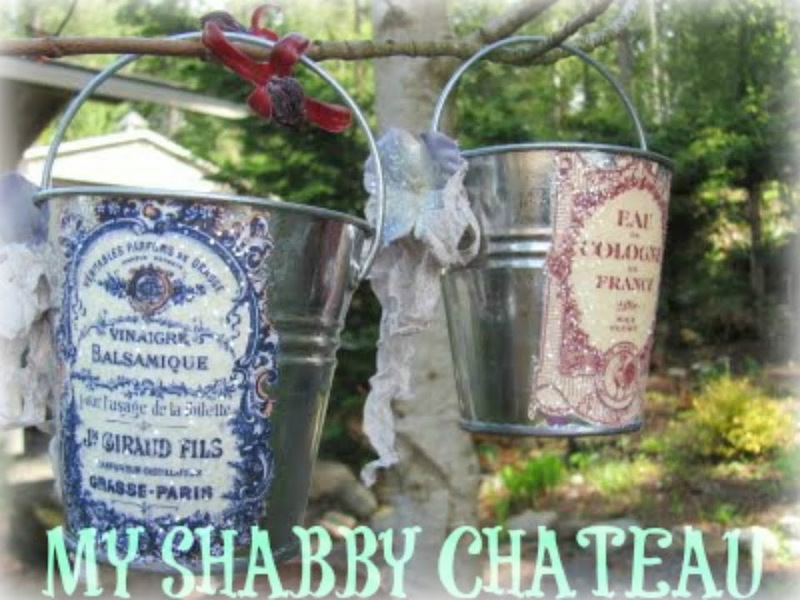 Visit The Shabby Chateau's profile on Pinterest. Glass Slippers and all sorts of stuff.. 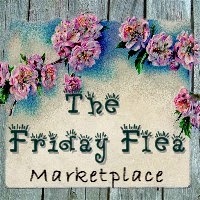 Lets Visit and Antique and Craft Faire! Care to Join Me for a Cup of Tea?